Winter is here, and so is the season of roof leaks. Any roof can leak if the conditions are right. However, older roofs are more likely to encounter the sorts of problems that cause leaks. If you find yourself running for a bucket every time it starts to rain, you are in need of a serious roof inspection and at least some repairs. The good news is that most leaks are fixable without a complete replacement. But it’s hard to know without a proper inspection. So if you have water coming through your roof and into your dining room, it’s time to call Eagle Watch Roofing. 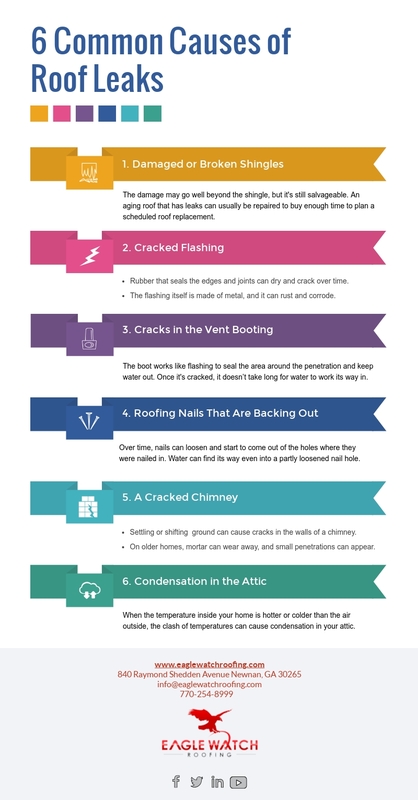 We’ll run down six common causes of roof leaks, many of which you can check for yourself. But leaks are notoriously hard to track, so calling in a professional is crucial before making any repairs. If your roof is nearing 20 or 30 years old, the shingles are the first place to look. Over the decades, exposure to sun, wind, and rain can cause shingles to rot, crack, and come loose. In many cases, the damage is visible from the ground. Look out over your roof and look for any discolored patches. After a heavy storm, you may even see bits of shingle littering the ground around your house. Some damage, like cracks, is harder to spot, so an inspection may be in order. A damaged shingle alone does not cause an immediate leak. However, when a shingle is damaged, it can start a chain reaction. First, the crack or tear is slowly made larger by weather and erosion. As the hole gets bigger, the underlayment beneath the shingle is exposed. Underlayment that is exposed can start to rot or soak through. Once the underlayment has been penetrated, there is nothing that stands between the weather and your roof decking. Roof decking is usually made of plywood and is not meant to get wet. If you leave the damage alone for long enough, it will become a leak. If you have a leak due to a damaged shingle, the damage may go well beyond the shingle. However, it still may be salvageable. An aging roof that has leaks can usually be repaired to buy enough time to plan a scheduled roof replacement. Flashing is the sheet metal that protects vulnerable areas of your roof from leaks. Flashing is always installed in valleys where two roof slopes meet. It is also installed around dormers, chimneys, and skylights where the roof is penetrated. So it is somewhat ironic that flashing, which is meant to prevent leaks, can become the cause of a leak. Two main problems can cause a leak in your flashing. The first problem is with the seal around the flashing. Depending on how your roof was constructed, it may have flashing that is sealed with rubber. Both the edge of the flashing and the joints in the flashing are sealed with tar or rubber, and that rubber can dry and crack over time. If your seal cracks, water can get under the exposed edges of the flashing and soak through to create a leak. Another problem is with the flashing itself. Flashing is made of metal, and it can rust and corrode. This is especially common where flashing has been dented by large hail, falling debris, or a careless roofer’s boot. Resealing flashing is usually an easy fix. Replacing corroded flashing is a bigger job, but it is much cheaper than replacing your roof. Plumbing vents and other features that penetrate the roof may be fitted with a rubber boot. The boot works like flashing to seal the area around the penetration and keep water out. But rubber will eventually degrade when exposed to the elements. Years of hot sun, driving rain, and blowing wind can dry out and crack a rubber boot. Once the material is compromised, it doesn’t take long for water to work its way in. Water that gets past the boot can easily make its way through the joint with the roof and through your living room ceiling. It may not be easy to spot a cracked vent boot from the ground. But if you feel comfortable climbing onto your roof, it is usually pretty easy to spot upon closer inspection. If your vent booting is cracked, it will need to be replaced. The costs involved can vary widely depending on the size and type of boot and whether it can be replaced with a standard boot or needs a custom size. However, this kind of repair is usually one of the cheaper fixes. On most roofs, the shingles are attached to the decking with nails. Over time, the nails can loosen and start backing out of their holes. When a nail backs out, it literally wriggles its way loose and starts to extricate itself from the hole where it was nailed in. If a nail backs all the way out, it can leave a tiny hole that is a conduit for rainwater. Backed out nails can be hard to spot, even from up close. A proper roof inspection by a professional roofer is usually required to find nails that have back out. There are several ways that your chimney is protected from rain. First, a chimney is almost always surrounded with flashing to keep rainwater for seeping between the seam where the chimney meets the roof. Second, on the “uphill” side of the chimney, many chimneys are fitted with a cricket. A chimney cricket is a small ridge behind a chimney that runs perpendicular to the slope of the roof. It directs water to either side of a chimney, so it flows around the chimney instead of collecting behind it. Finally, most chimneys are fitted with a cap that keeps out rain. However, most chimneys are made of brick and mortar, which is susceptible to damage over time. In older homes, shifting ground or even small earthquakes can cause cracks in the walls of the chimney. The mortar is also a weak point for the chimney. Mortar can last a long time, but on older homes, it can eventually be eaten away, and small penetrations can appear. If your home is older than 30 years, it may be worth checking the chimney for cracks when trying to trace a leak. The air in your attic is sandwiched between the climate-controlled air of your home and the air outside. When the temperature inside your home is hotter or colder than the air outside, the clash of temperatures can cause condensation in your attic. If your attic has adequate ventilation, it is usually sufficient to prevent condensation. Unfortunately, many homes are built without the necessary attic ventilation. Also, if there is excessive air leakage from your home to your attic, it can outpace the ventilation. If you think you are getting condensation in your attic, just open up the attic and take a sniff around. If you notice a musty smell, it’s a sign of hidden water damage. Of course, if there is any visible mold or rot, there is definitely water in your attic. Water in your attic does not necessarily come from condensation—it can come from the roof, too—but it is a sign to check your ventilation. Leaks are notoriously hard to track down. Water will always flow to the lowest point before it pools inside your ceiling and becomes a leak. Often, a leak in your ceiling can develop far from its source on your roof. Finding the cause of a leak and fixing it is best done by experienced professionals. We’ve seen some cases where an inexperienced roofer thought they had found the source and fixed it, only for the leak to reappear with the next heavy rain. If you have a leak, contact us, and our experts will inspect your roof and find the source. Once we spot the source of a leak, we will determine how much work needs to be done. We can help you decide between minor repairs and replacement of an aging roof. Eagle Watch Roofing experts also help with any claims against your insurance. We want to make sure you get everything you deserve and spend as little out of pocket as possible. So don’t wait to take care of your roof. Call us today!